This post is for small to mid-sized manufacturers interested in learning more about PBS™ Manufacturing. We hope you find it helpful. There are many benefits of using PBS™ Manufacturing software for small businesses and mid-sized companies, and the benefits one company will receive will be different than another’s. A company can use the PBS™ Manufacturing to help reduce inventory. Proper planning will help eliminate over ordering raw materials and can help reduce the money wasted in unnecessary product sitting on the shelf. A company’s efficiency may be increased dramatically by the use of the PBS™ Manufacturing software for small businesses and mid-sized companies. Depending on their system configuration, they could see an increase in on-time deliveries, and overall throughput on the production floor. This may be achieved through better shop floor scheduling and /or by improved material planning. Simply having the material you need when you need it is enough to improve efficiency in many manufacturers. Add in the ability to do sales forecasting for a company that makes the same products over and over and demand is predictable, and you can have product on the shelf and ready to ship at a moments notice. Many companies have no idea how much it truly costs them to manufacture the products they sell. Typically, they have some idea based on engineering projections, but unless they invest the time to track actual costs against jobs, they really don’t know. Some companies attempt to do this manually with very limited results. PBS™ Manufacturing software for small businesses can help a manufacturer capture their actual costs and allow them to compare those costs to the original estimates. It also provides the visibility needed to determine why these costs differ so that product structures and routings can be adjusted accordingly. This is all captured while employees are doing their daily reporting of materials and labor against jobs going through production so virtually no additional overhead is required to gain this visibility. Using this method can help the make to stock or make to order company by allowing them to get the real picture of cost and profits. As previously stated, adjustments can be made to bring profits in line with expectation. The job shop can benefit by this as well. They can see how profitable they are on each job they produce. While they may never make the product again, they can use this information to investigate areas of weakness in the quoting process, should any exist. 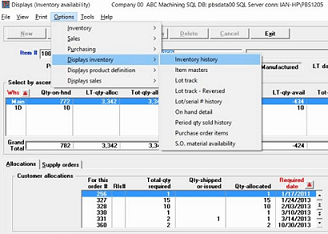 PBS™ Manufacturing software for small businesses can help improve long-term profitability by refining the quoting process. When a company can improve its efficiency and productivity, reduce its inventory carrying costs, and get a better handle on what their products really cost them to make, they will often see this reflected in the form of increased profits. For more information call Dave Dorsey at 800-969-7900 x145. Or Contact Us – We are here to help.